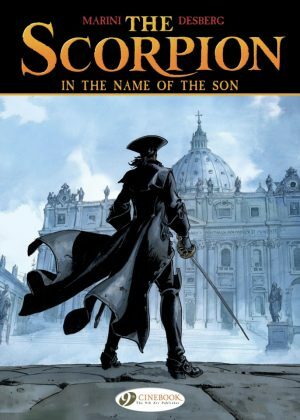 With his hopes of bringing down Trebaldi destroyed in The Treasure of the Templars, the Scorpion returns to Rome to find the city consumed by the new Pope’s reign of terror. In an attempt to purify the citizens of sin, Trebaldi and his army of warrior monks have sentenced hundreds to death. Despite commanding power over the Catholic church however, conflict with his own family continues to develop. It would seem ruthlessness runs in his blood, as Trebaldi’s father murders in a bid to push his youngest son Nelio into action. 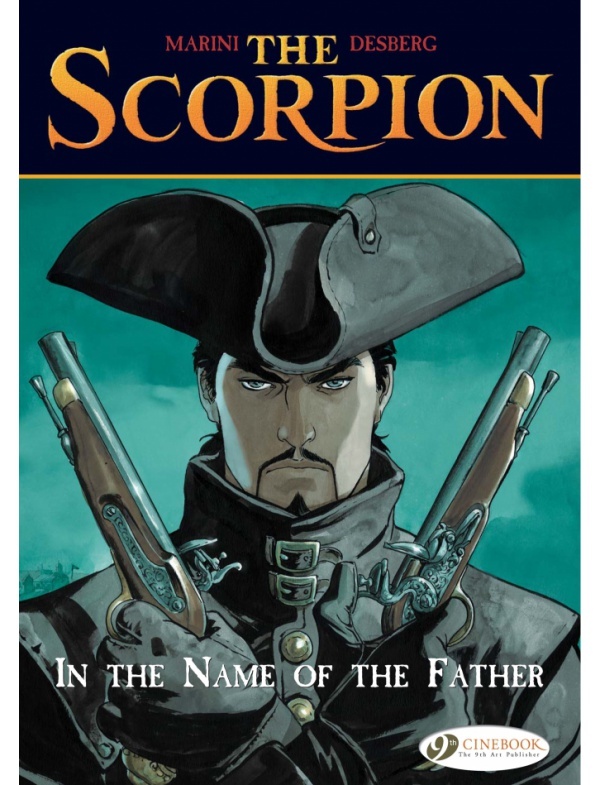 It is clear from the chequered history of Trebaldi, which is slowly being revealed to both the reader and to the Scorpion, that tensions between the family members still run high. 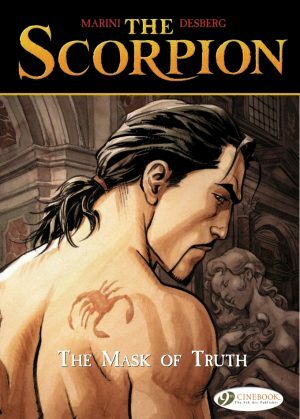 The majority of the new story arc is set in the darkened streets of Rome, as the Scorpion and his companions try to solve a mystery without attracting the attention of the Pope and his army. Mejai joins Armando on his journey for answers, and the ever complicated relationship between the two reaches a climax. As interesting as the introduction and progression of characters are to Stephen Desberg’s intricate narrative, this is one of the weaker personality explorations. Although their love/hate relationship was refreshing at first, and suited Armando’s arrogant lothario personality, by volume five it has become a little tiresome and somewhat predictable. In contrast Hussan and Fenice’s romance seems too rushed. Having begun as a strangely forceful and somewhat one-sided affair, Hussan spends In the Name of the Father pining for her. 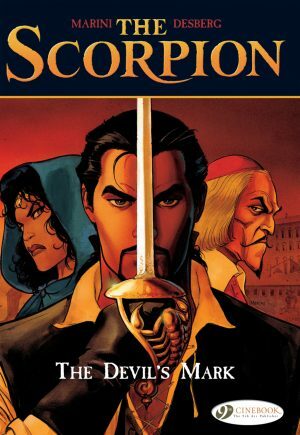 Thankfully The Scorpion is primarily an action/adventure comic which is where Desberg’s skills as a writer truly lie. Enrico Marini’s art continues to flourish, shifting from eloquent parties, to pub rabbles, and carriage chases. 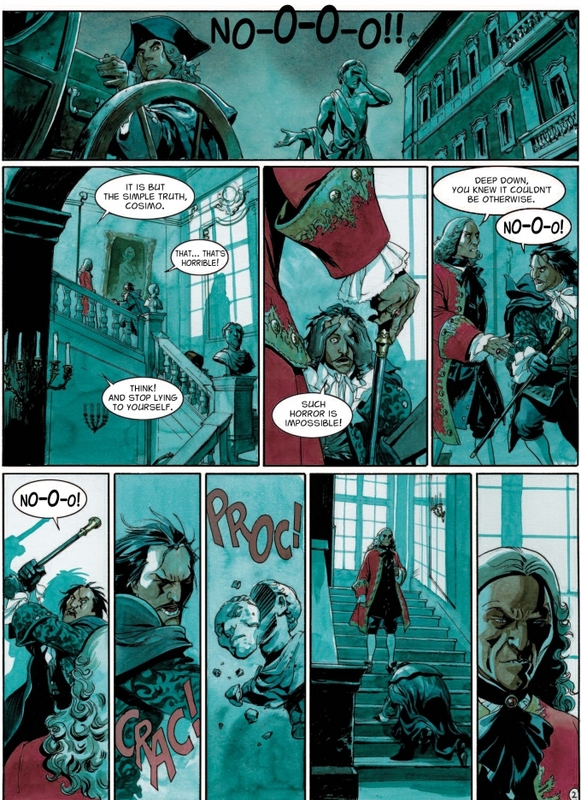 As this is the introduction to a new story arc, much of the action is subdued to set up the plot, and this gives Marini room to focus on characters and tone more than previously. 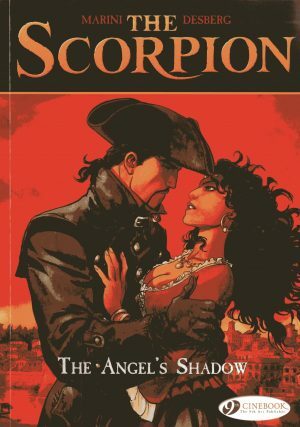 Volume five of The Scorpion is on par with its predecessors, building suspense to the epic finale where the two rivals eventually confront one another, which in turn leads to yet another cliffhanger ending. Although some areas of the narrative are less developed or clichéd, the story is overall as enticing as ever and the next volume, The Angel’s Shadow, seems likely to continue to pull readers further into the drama of this unique historical adventure series.